Screen sharing with Messages allows you to easily contact to other Mac desktops. This co-operative screen sharing is a great way to troubleshoot issues with a friend. It also provides a unique way for you to teach others how to use a Mac application. When you're sharing someone's screen, it's just like you're sitting down at his or her computer. You can take control and work with files, folders, and applications, anything that is available on the shared Mac's system. You can also allow someone to share your screen. Before you can ask someone to share your Mac's screen, you must first set up Mac screen sharing. The process is pretty straightforward; you can find instructions here:​ Mac Screen Sharing - Share Your Mac's Screen on Your Network. Once you have screen sharing enabled, you can use Messages or iChat to allow others to view your Mac, or to view someone else's Mac. Why Use Messages or iChat for Screen Sharing? Neither Messages nor iChat actually performs the screen sharing; instead, the process uses the built-in VNC (Virtual Network Computing) clients and servers in your Mac. So, why use messaging apps to initiate screen sharing? By using the messaging apps, you can share your Mac's screen over the Internet. Even better, you don't have to configure port forwarding, firewalls, or your router. If you can use Messages or iChat with your remote buddy, then screen sharing should work (assuming there's a fast enough network connection between the two of you). 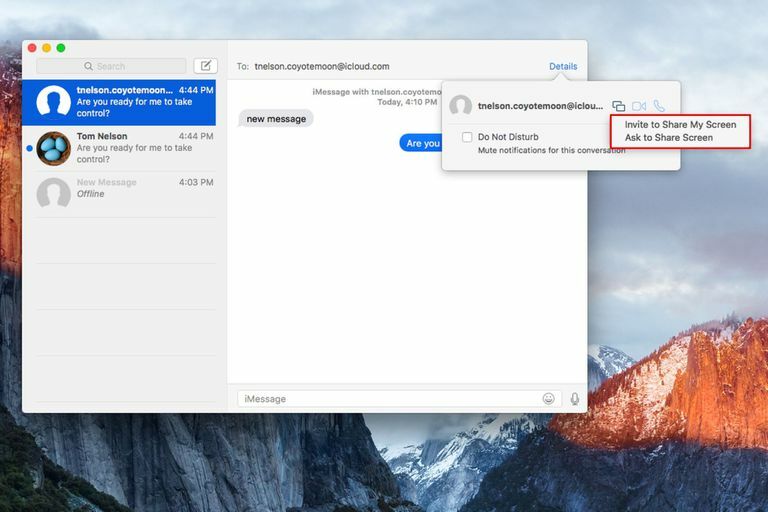 Messages or iChat-based screen sharing can't be easily used for remote access to your own Mac since both messaging apps assume that there's someone present at both machines to initiate and accept the screen sharing process. If you attempt to use Messages or iChat to log into your Mac while you're on the road, there won't be anyone at your Mac to accept the request to connect. So, save the messaging apps for screen sharing between you and another individual; there are other screen-sharing methods you can use when you want to remotely connect to your own Mac. Launch Messages, located in the /Applications folder; it may also be present in the Dock. Initiate a conversation with your friend, or select a conversation already in process. Messages makes use of your Apple ID and iCloud to initiate the screen sharing process, so screen sharing with Messages won't work for Bonjour or other Messages account types; only with Apple ID account types. In the selected conversation, click the Details button in the top right of the conversation window. From the popup window that opens, click the Screen Sharing button. It looks like two small displays. A second popup menu will appear, letting you choose to Invite to Share My Screen or Ask to Share Screen. Make the appropriate selection, depending on whether you wish to share your own Mac's screen, or view your friend's screen. A notice will be sent to the friend, informing them that they have either been invited to view your screen or that you're asking to view their screen. The friend can then select to accept or deny the request. Assuming they accept the request, screen sharing will start. The friend viewing your Mac's desktop can only initially view the desktop, and won't be able to interact directly with your Mac. They can, however, request the ability to control your Mac by selecting the Control option in the Screen Sharing window. You'll see a notice that control has been requested. You can accept or deny the request. Either party can end the screen sharing by clicking the flashing double display icon in the menu bar, and then selecting End Screen Sharing from the dropdown menu. If you haven't already done so, launch iChat. In the iChat list window, select one of your buddies. You don't need to have a chat in progress, but the buddy must be online and you must select him or her in the iChat list window. Select Buddies, Share My Screen With (your buddy's name). A screen sharing status window will open on your Mac, saying "Waiting for response from (your buddy)." Once your buddy accepts the request to share your screen, you will see a large banner on your desktop that says "Screen Sharing with (buddy's name)." After a few seconds, the banner will disappear, as your friend starts viewing your desktop remotely. Once someone starts sharing your desktop, they have the same access rights as you do. They can copy, move, and delete files, launch or quit applications, and change system preferences. You should only share your screen with someone you trust. To end screen sharing, select Buddies, End Screen Sharing. Select Buddies, Ask to Share (your buddy's name) Screen. A request will be sent to your buddy asking for permission to share his or her screen. If they accept the request, your desktop will shrink to a thumbnail view, and your buddy's desktop will open in a large central window. You can work in your buddy's desktop just like it was your own Mac. Your buddy will see everything you do, including seeing the mouse moving around their screen. Likewise, you will see anything your buddy does; you can even get in a tug of war over the shared mouse pointer. You can switch between the two desktops, your buddy's and your own, by clicking in the window for whichever desktop you wish to work in. You can also drag and drop files between the two desktops. You can quit viewing your buddy's desktop by switching to your own desktop, then selecting Buddies, End Screen Sharing. You can also just click the close button on the thumbnail view of your buddy's desktop.